Here is my very first release. It is Scott's Gunslinger, repainted to commemorate the race-ins who did not qualify for the MJT World Finals 3 and it was piloted by my good friend Mark Iron. Originally didn't plan to release it, but a few people requested it. 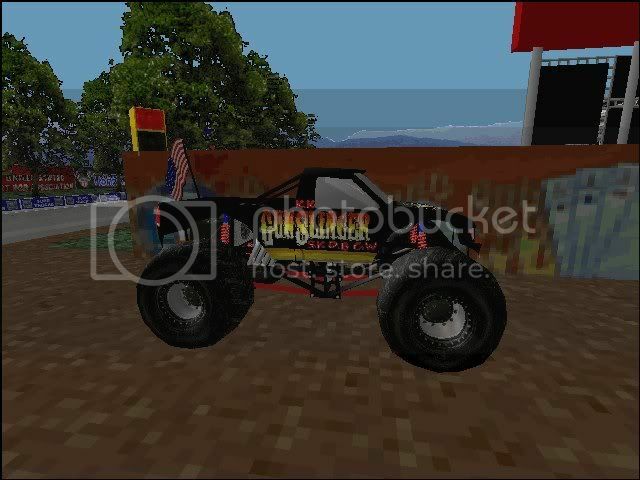 Also added the Grave Digger flag and retextured it and Mark had slapped on some of White's new SIR tires and they knocked the truck out. The initials of those that did not make the event are on the sides and hood of the truck, and there was a special message for them on the tailgate, enjoy! Location: In BinEdit, using YOUR models. I saw it on Draggers. "This is to all the people who didn't make it," or something like that, is on the back. Last edited by TlathamXmahtalT on Sun Mar 22, 2009 12:26 pm, edited 1 time in total. "THIS IS FOR YOU WHO DIDNT MAKE IT"